Post-1950s, the newest trend became nuclear and Atomic Age-inspired home and office designed products. Ultimately, manufacturing and consumer goods companies got in on this literal nuclear explosion. A person could purchase consumer items, such as light fixtures, furniture, artwork, toys, and even architectural homes from nuclear-inspired designs. 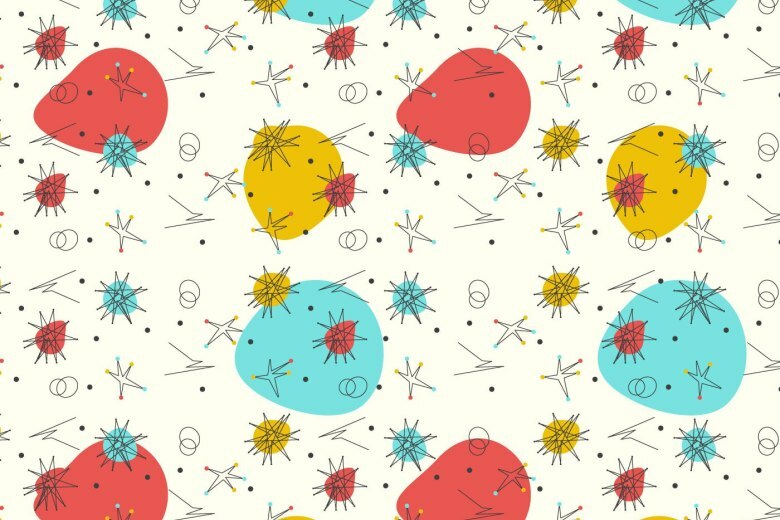 Additionally, Atomic Age shapes and patterns were virtually found on everything-household textiles, appliances, counter-tops, wall clocks, jewelry, and consumer good packaging. As weird as it sounds; although the public was totally terrified of the thought of nuclear weapons- as we are today-they still had a fascination for anything related to the mid-century Atomic Age. Shapes during this period were also known as “organic,” referring to the rounded shapes of microscopic living organisms, and geometric. 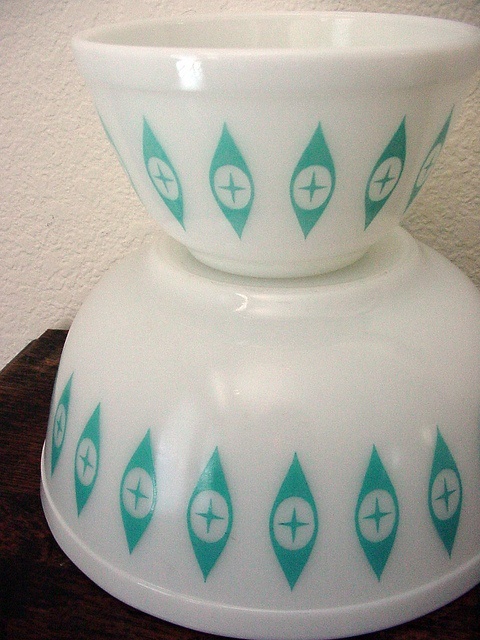 One of the most popular Atomic Age patterns found in the kitchen was Corning Glass Works Pyrex ovenware, “eyes” pattern. 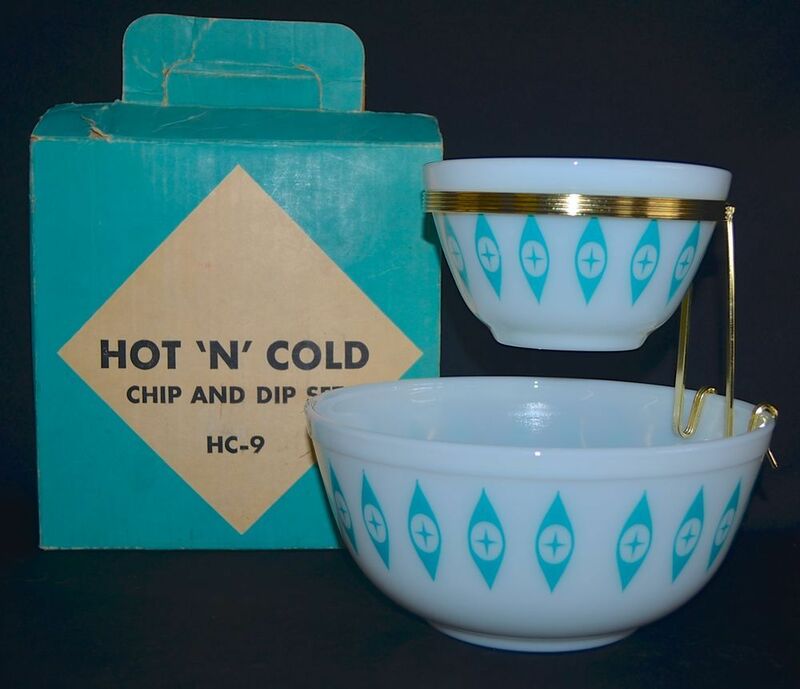 This set is believed to be one of the first patterns released as a “Chip and Dip set which came with a metal bracket, The bowls were numbered 401 and 403. to hold is set is one of the first patterns released as a Chip and Dip set. This set may or may not, have the normal Pyrex stamp on their bottoms. This particular retro pattern features a turquoise blue, elongated oval or diamond shape, with a cross on the inside. Starting in 1953, Corning Glass Works offered its first patterned opal glass kitchenware in grocery stores. Because of an overwhelming success with the 1956 release of “decorator casserole dishes,” gift sets featuring new patterns on existing Pyrex kitchenware types. Each pattern was offered for only a limited time. For the next 30 years, Corning created approximately 135 different gift set patterns in all.